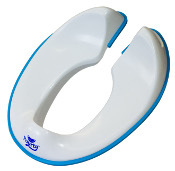 The Flexi-Fit Toilet Trainer fits securely to most shapes and sizes of adult toilet seat. Its low profile and ergonomic design are perfect for giving boys and girls the confidence to potty train on the big toilet in comfort. The big toilet can be quite daunting for toddlers when potty training as they are high up off the ground and adult toilet seats are too wide to support them. Toilet training seats are designed to reduce the size of the toilet seat, but adult toilet seats vary in size and most toilet trainers are not adjustable. This means that they wobble around on top of the adult toilet seat, which can be very off putting for the child (even for an adult it’s not very nice if you are sat on a toilet seat that moves around!). 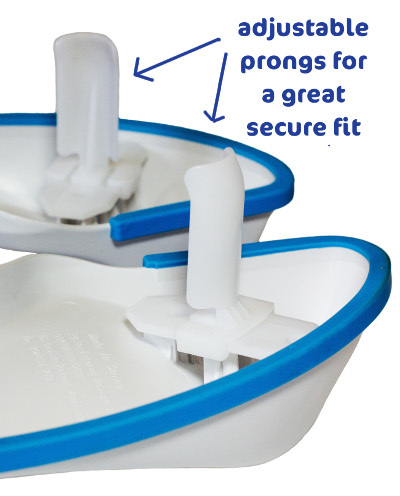 The Flexi-Fit Toilet Trainer has a unique squeeze flex action and a djustable prongs so that it fits securely and doesn’t wobble. This gives the child confidence and enables them to relax and focus on toilet training. 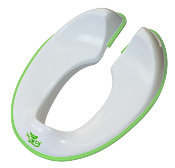 The Flexi-Fit toilet training seat also has a deep splash guard at the front above and below the seat to help stop your child from peeing over or out from under the toilet seat. It has a low profile and is ergonomically designed for greater comfort without raising the child too high above the normal toilet seat. The Flexi-Fit comes in a stylish but discrete white with a blue, pink or green rubber rim. Please note that the Flexi-Fit does not fit as securely to large rectangular toilet seats. The Flexi-Fit Toilet Trainer is now available for purchase from Amazon the Pourty Online Shop for £14.95. Click on the image below to see our demonstration video.